Quite the surprise arrived in the mail today- the new issue of Poz magazine, which had some familiar faces staring back at me. So honored to be gracing the cover with my incredible partner in an issue that celebrates the HIV negative allies among us. I wouldn’t be who I am today without the support of people who could have turned their heads the other way when the going got rough for me after testing positive- my friends, family, parents of friends, doctors, teachers. That initial support system gave me a foundation that proved invaluable when I started dating, from the confusing terrain of teenage love to young adulthood and all the lessons we learn along the way. By the time I met the person who would become my greatest HIV negative ally, Gwenn, I was ready to be the HIV positive ally she needed and deserved. 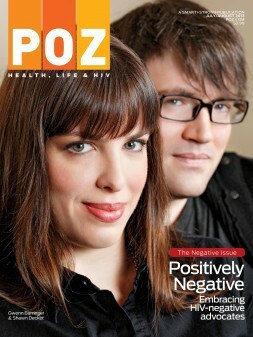 So, be sure to read the latest issue of Poz Magazine and join in the celebration of those who found themselves involved in a cause- not because of an HIV positive test result, but because their own unique journeys on the winding road of life lead to an intersection that crossed with HIV/AIDS. And instead of turning a blind eye, they instead chose to make an unexpected turn. And we are all the better because of it.